This entry was posted in Golfyoga Mastery on December 19, 2017 by Jess Weitz. This entry was posted in Golfyoga Mastery, Uncategorized on December 19, 2017 by Jess Weitz. My favorite sports psychologist is without a doubt Dr. Bob Rotella. His books and CDs over the years have given me the guidance to play the kind of golf that is very satisfying and meaningful to me. One of the most important concepts I have learned from him is to “Train it and Trust it”. Here are some excerpts from his wonderful book Golf is Not a Game of Perfect. What does playing golf mean to you? If you’re interested in finding out what it means to me, I encourage you to read The Yoga Oasis by golf writer Tom Bedell. In the article, you’ll find out why I took up golf again after a 35-year hiatus–and why I believe golf and yoga complement each other so beautifully. This entry was posted in Golfyoga Mastery and tagged golfyoga, yoga for golfers on December 19, 2017 by Jess Weitz. I hope this finds you well, and that you have enjoyed a wonderful season of satisfying, meaningful golf! 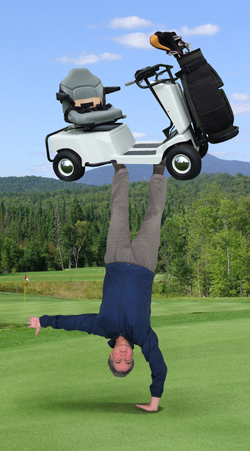 As you know, I have needed to miss the last two golf seasons due to a shoulder complications. I can’t tell you how much I am looking forward to playing golf next year! I plan to play a LOT, and having a lot of fun playing and I’m looking forward to practicing a lot. My goal is first and foremost, to have fun, and to play in the 70s at least 25% of the time. In the meantime, I invite you to go to Yoga for Golfers 2018 which describes the yoga for golfers class that I am teaching from January through April 2018. I would love to have you in the class! PS coming soon – Golfyoga Mastery private lesson packages with me and the very gifted physical therapist Alice Kenney!